Written by Charles on August 30, 2018 in Blog. Condos are a wonderful way to spend your Maui vacation, but what if you want a property all to yourself — an entire house, yard, and maybe even your own swimming pool? 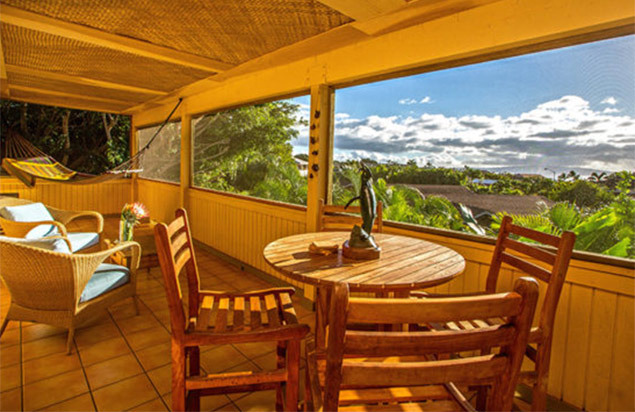 We’re excited to offer two new private, self-standing houses to our Maui luxury accommodations line up. These homes offer all the ambiance and extras of our condos — natural light and breezes, island-style decor, fully-equipped kitchens, etc. — but with additional personal space and privacy. Read on! 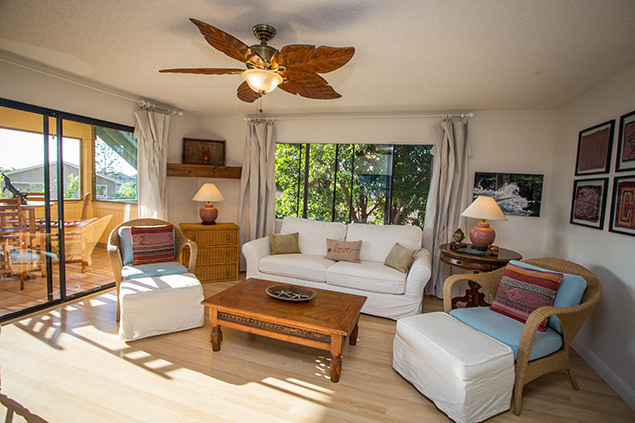 Tucked away between the towns Kihei and Wailea in South Maui is Maui Bliss Villa, where you can instantly step into your own personal island getaway. 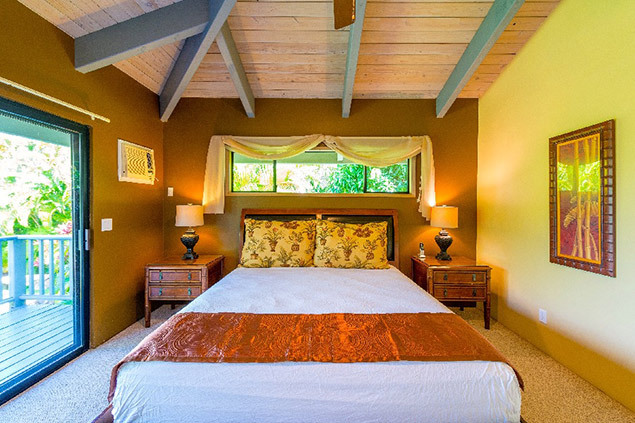 Don’t be fooled by the discreet appearance of the front of the house — just behind the garage and rock wall is an oasis of comfort, privacy and world-class views of the Pacific Ocean, Haleakala, Kahoolawe and Lana’i towards the West Maui Mountains. 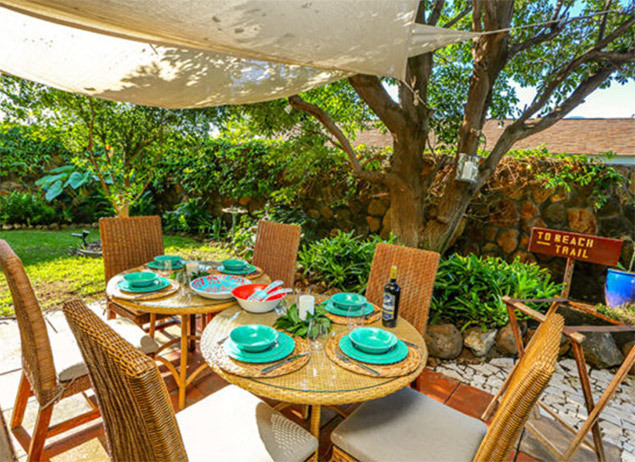 The interior of this 4 bedroom / 3 bath home features hardwood floors, chef’s kitchen, a rooftop sundeck, tasteful island decor, a meditation garden, grassy lawn, outdoor dining area, tropical fruit trees and some hammocks for relaxing. If you’re bringing an extra guest who needs their own privacy, Maui Bliss Villa features a separate “Ohana” unit (additional living space) with a bedroom, bathroom and additional full kitchen. Beaches, shops, grocery stores and restaurants are mere minutes away. Would you turn down your own private swimming pool in Maui? Probably not, especially if it was on a property as sweet and luxurious as the Maui Dolphin House in Kihei. The 4 bedroom, 3 bathroom gated home is nestled in the family-friendly neighborhood of Maui Meadows in sunny South Maui. Like Maui Bliss Villa, this home is mere minutes from the amenities of Kihei town as well as the golf, tennis, spas and shopping of nearby Wailea. The interior of this house is bright and cheerful with a open floor plan designed for socializing and relaxing. High vaulted ceilings create a sense of abundance and spaciousness. 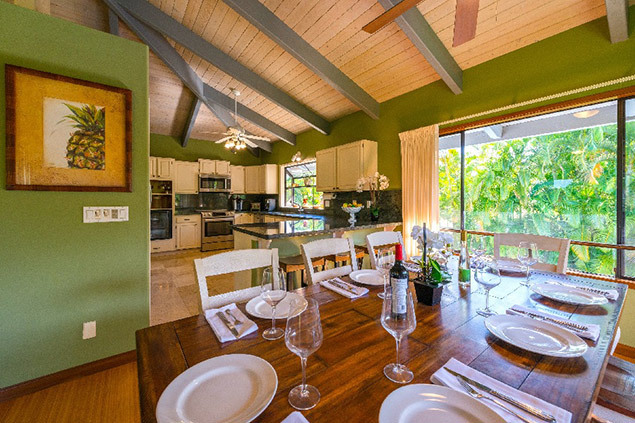 The gourmet kitchen is freshly renovated, complete with stainless steel appliances, a wine cooler and bar for three. 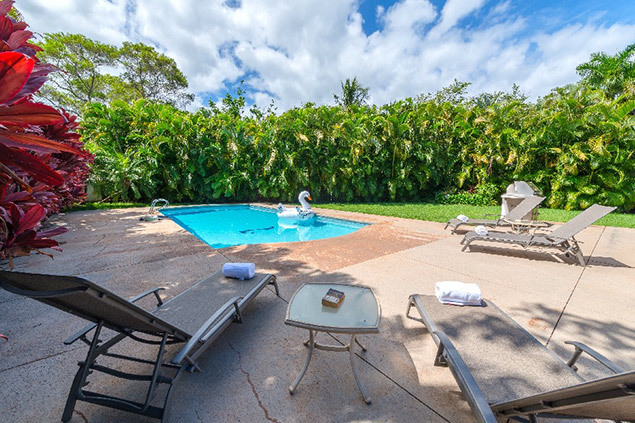 The highlight of Maui Dolphin House is the swimming pool, which you get to enjoy all to yourself. Tucked up to the pool is an large outdoor lanai with a gas barbecue grill and lounge chairs for sunning or gazing at the stars on any given warm night. And right next to all that is the indoor recreation room with its own fridge, futon and bar area.